SEATTLE -- China is seeking to tap the flood of cheap natural gas coming from the interior of North America by converting it to methanol at three huge refineries in Washington and Oregon. The refineries could increase demand for natural gas in the Pacific Northwest by 40 percent. They would more than triple the size of the fast-growing U.S. methanol industry. With an estimated $7 billion price tag, the refineries would be one of the largest investments ever by China in new U.S. manufacturing. The largest plant, planned for Tacoma, could use more water than all the residential customers of the city's public utility district combined. "This is really a cross-Pacific collaboration," said Simon Zhang, the project's CEO and a former official with BP who is based in Shanghai. "It's very unique in that it brings a benefit to both sides of the Pacific very clearly." However, the plan is being viewed warily by Pacific Northwest environmental groups, which have proved effective at slowing a long list of proposals to deliver coal, oil and natural gas from the continent's midsection to hungry markets in Asia. "They fit into the pattern of more fossil-fuel infrastructure built on the Columbia that we have concerns about," said Brett VandenHeuvel, the executive director of Columbia Riverkeeper. Two of the three refineries would sit on the banks of the Columbia River. The Chinese proposal, first made public last year, is different from other projects that would export raw fossil fuels. First, the end goal is methanol, a crucial building block of plastic and many other materials of modern life. Second, China would be the sole recipient. 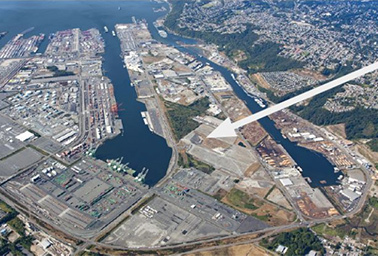 China would build the world's largest methanol refinery at this site in the Port of Tacoma, where an aluminum smelter once stood. Photo courtesy of Northwest Innovation Works. Third is that it aims to lower greenhouse gas emissions in China, while raising them to a lesser degree on American shores. China is the world's largest producer and consumer of methanol, and it manufactures almost all of it from coal, which creates a great deal of carbon emissions. Reducing carbon emissions across industries is an increasingly urgent goal for China, which will be a key player at the Paris climate talks at the end of this month. In September, China announced it would establish a carbon-trading market by 2017. The Pacific Northwest venture claims that using natural gas instead would reduce emissions by 70 percent, and that it will employ a new technique that reduces the carbon footprint even further. Northwest Innovation Works says the three refineries would create 3,000 construction jobs and 460 permanent jobs. It could spawn new customers for natural gas in the Pacific Northwest, where industrial jobs have been on the wane. The proposal has received an enthusiastic endorsement from Washington Gov. Jay Inslee (D). The factories would also use enormous quantities of water, an obvious selling point for China and a potential flashpoint in the Pacific Northwest. China has chronic water shortages, while Washington and Oregon have lots of it -- though that supply is in question as climate change reduces the region's snowpack. Two of the refineries would sit on opposite banks of the Columbia River, one in Clatskanie, Ore., about an hour's drive northwest of Portland, and the other at the Port of Kalama in Washington state. Both would produce about 5,000 metric tons of methanol a day, which would put them on par with the world's largest methanol plants. But both would be dwarfed by a third proposed refinery at Tacoma, a busy industrial port a half-hour south of Seattle. Double the size of the other two, it would be the largest methanol refinery ever built. The new refineries would bring an even steeper growth curve to an already fast-growing methanol industry in the United States. Methanol, also known as methyl alcohol or wood alcohol, is a precursor to hundreds of products, from plastics to fabrics to paints to windshield wiper fluid. The Washington and Oregon projects, like other plants, would combine natural gas with steam and heat to make a synthesis gas of carbon monoxide, carbon dioxide and hydrogen. That gas is heated and compressed and run over a catalyst to make a crude methanol, and then it is distilled with water. The resulting methanol -- colorless, flammable, and a liquid at atmospheric temperature -- would be shipped to China, where it would be converted into olefins, such as ethylene and propylene, and used to make a range of products. The Northwest proposal comes as the U.S. methanol industry is surging. Flooded with inexpensive natural gas as a feedstock, it is producing 4.5 million tons a year, up from less than 1 million tons as recently as four years ago, said Gregory Dolan, the CEO of the Methanol Institute, a global trade association. The new Oregon and Washington refineries would blow that away. Their output would be 14.4 million tons a year, or more than triple what the United States produces now. While the United States has its own methanol demand, of about 6.5 million tons, the natural destination is China, which produces 45 million tons of methanol a year and uses well over half the world's supply. "China is a pretty big sponge that can soak up a lot of methanol," Dolan said. Spearheading the $7 billion project is the Chinese Academy of Sciences Holdings Co. Ltd., or CASH, which is the commercialization arm of the Chinese Academy of Sciences, a sprawling quasi-governmental organization that employs more than 48,000 researchers and sponsors much of China's basic and applied science research. The methanol plants in the Pacific Northwest would resemble this one in Trinidad, according to project documents. Photo courtesy of Northwest Innovation Works. Originally its partner was the oil company BP. Earlier this year, BP has sold its part to an investor group, called Double Green Bridge, made up of managers of CASH. Northwest Innovation Works is officially owned by a management company, Shanghai Bi Ke Clean Energy Technology Co. Ltd., which says on its website that it is "poised to revolutionize the global methanol industry." Zhang, the CEO of Northwest Innovation Works, said the idea for the methanol refineries came through conversations with the staff of the Oregon governors' office during various trade missions. Thereafter, it snowballed into a trio of projects with a larger footprint in Washington than in Oregon. It is unclear how much of the $7 billion would come from China and how much from elsewhere, but the project has already received significant backing. In September, Stonepeak Infrastructure Partners, a New York company that invests in natural gas piping and shipping, signed on as an investor, as did Noble Group Ltd., a Fortune 100 shipper of raw materials, based in Hong Kong. A user, Xizhong Island Petrochemical Park in Dalian, China, has already agreed to buy the methanol and is building storage tanks to receive it. 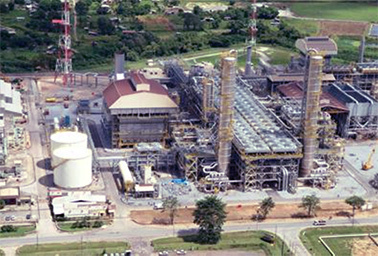 A final investor is Johnson Matthey, a British chemicals company that has a process for manufacturing methanol that could reduce carbon emissions still further. Northwest Innovation Works has said it will use this process at all of its plants, though the technique has never been tried in the United States or at this large of a scale. Normally, 30 percent of the gas that feeds a methanol plant is burned in the process. But Johnson Matthey relies more on electricity to produce the necessary heat, perhaps 200 megawatts per day at the two smaller plants and 400 MW per day at the Tacoma facility, according to project estimates. That substitution -- electricity for natural gas -- has become a major selling point for the Chinese proposal's proponents, since the majority of electricity in Oregon and Washington comes from hydropower dams, which have almost no carbon emissions. "The fact that Washington has hydro means that you're taking a very clean energy to reduce your environmental footprint, which reduces your environmental footprint even more," said Northwest Innovation Works spokeswoman Charla Skaggs. For China, making methanol from natural gas in the U.S. Pacific Northwest also could solve thorny logistical problems. Natural gas is scarce and expensive in China. Meanwhile, coal is abundant but is mined in central and northwestern China, far from the industrial demand in the east and south. "It's cheaper to ship it from Oregon or Washington than it is from elsewhere in China," Dolan said. Oregon and Washington are also closer to China than the Gulf Coast states of Texas and Louisiana, where most of America's methanol is currently made. Shipping time is cut in half. "Clearly, time is money," Dolan said. "So there's some real economic value to that benefit." Environmental groups say that it's hard to know what to think of these proposed methanol refineries, since little information has yet been made public. Furthermore, green groups already have their hands full trying to hold back a wide variety of proposals to ship coal, oil and natural gas through the Pacific Northwest en route to Asia. "The environmental community is in the thick of what looks like a barroom brawl over coal exports and oil trains right now, and everyone's attention is heavily on those projects," said Eric de Place, a policy director at the Sightline Institute, an environmental think tank headquartered in Seattle. Since the Northwest Innovation Works proposals first emerged last year, only the facility in Kalama has begun the environmental reviews that yield specifics on pollution and the needs in terms of water, electricity and natural gas. The projects, if built, would likely transform the natural gas infrastructure of the Pacific Northwest, where demand has been flat since the Great Recession. Dan Kirschner, the executive director of the Northwest Gas Association, estimated that the Northwest projects could increase average daily natural gas consumption in the Pacific Northwest by 40 percent. "That's a lot of gas," he said. Since a cold day across the region would stretch capacity to the limit, the Northwest project would need to take the lead in building new pipelines to bring gas in from British Columbia, Alberta or the Rocky Mountains. Doing so might catalyze other businesses to use it. "Once you get an anchor tenant in the shopping mall, all the other tenants come along," Kirschner said. It would also require lots of water. Northwest Innovation Works guesses its Tacoma plant would use roughly 10,000 gallons per minute, and perhaps more. De Place, of Sightline Institute, did some rough calculations and estimated that the Tacoma plant could consume a million more gallons a day than all the residents of Tacoma served by the Tacoma Public Utility District. "That's a lot of water, especially as we're facing a more drought-like future," said de Place. "if you're thinking of a project that basically doubles the amount of water relative to Tacoma's population, it's not clear where that comes from. We don't have a lot of water just lying around."